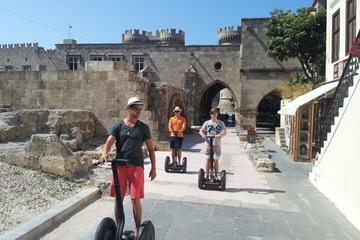 The old city of Rhodes. The Greek island of Rhodes, the largest and, for some, the most beautiful of the 12 islands forming the Dodecanese in the Aegean Sea, has long played a major role in history. Lying just 12 miles off the coast of Turkey, the island straddles the sea-lanes linking Greece, Egypt, and the Holy Land. Rhodes Town bears witness to that long history. The ancient city features a classical stadium and the ruins of the Temple of Apollo. The "old" city is a walled town with medieval buildings and streets harking back to the days of the Crusades. The new town is a Mecca of luxury resorts lining the island's picturesque Mandaraki Harbor. The Colossus of Rhodes, one of the Seven Wonders of the Ancient World, is reputed to have once stood guard over the harbor. Today, the bronze statues of a stag and doe top the two columns marking the port entrance. For additional information on Rhodes and a selection of accommodation choices, you may consult the relevant Booking page! Once home to the Knights of St. John, this medieval walled city is a living settlement of some 6,000 people who live and work in the same buildings that were used by the knights over 500 years ago. Built in the 14th century by the Knights of St. John, its fortress defended the town and harbor. Destroyed in 1856 and rebuilt in 1939, it now houses a museum with ancient Greece exhibits. This medieval road features the lodgings of the Knights of St. John. They represent the seven countries or languages from where the Knights came and lead to the Palace of the Grand Masters. Above the village rises an awe-inspiring fortress, which was fortified in turn by the Greeks, Romans, Byzantines, Knights of St. John and the Ottomans. Landmarks include Temple of Athena Lindia. The Church of Panagia (Our Lady) was originally built in 1300, but has been reconstructed several times. With high walls and charming courtyard, it is an enchanting stop on the road to the Acropolis. Built to symbolize freedom, this bronze statue of the Greek god Helios stood 110' high on a 50' pedestal. Felled by earthquake, huge pieces lay for centuries until the 7th century A.D. This peak is crowned by the Church of Our Lady, which is built over the ruins of a Greek temple and early Christian catacombs. The barrel-vaulted Chapel of St. George dates from the 15th century. ​Although named after a 19th century British admiral, this is the site of ancient Rhodes' Acropolis and Hellenistic stadium where the athletic games of Alioi took place to honor the Greek god Ilios (Sun). and explore the narrow alleys in small groups with an experienced guide, in English. 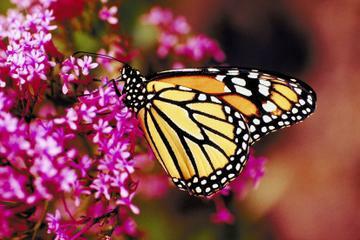 Visit Rhodes’ Valley of the Butterflies with a private guide on a 4-hour excursion. Enjoy a hotel pickup at your schedule, travel to the nature reserve on the western side of Rhodes, and stroll around leafy walkways and streams. Hear of the different tiger moths that thrive in the Valley of Butterflies and pay a visit to the on-site Museum of Natural History, if time permits. Entrance fees and food are at your own expense.